ROME, Apr 4 2017 (IPS) - Good news: Kenya has just joined the commitment of other 10 countries to address major plastic pollution by decreeing a ban on the use, manufacture and import of all plastic bags, to take effect in six months. The Kenyan decision comes three weeks after the UN declared “war on plastic” through its new UN Clean Seas initiative, launched on at the Economist World Ocean Summit in Bali (February 22-24, 2017). The initiative’s campaign urges governments to pass plastic reduction policies; industry to minimise plastic packaging and redesign products; and consumers to change their throwaway habits before irreversible damage is done to our seas. “Kenya is taking decisive action to remove an ugly stain on its outstanding natural beauty,” Erik Solheim, Head of UN Environment Programme (UNEP) commented on the Nairobi government’s decision. Some 100 million plastic bags are handed out every year in Kenya by supermarkets alone, the UN informed, adding that long identified as a major cause of environmental damage and health problems, they kill birds, fish and other animals that mistake them for food, damage agricultural land, pollute tourist sites and provide breeding grounds for the mosquitoes that carry malaria and dengue fever. According to UNEP, plastic bags are the number one challenge for urban waste disposal in Kenya, particularly in the poorest communities where access to disposal systems and healthcare is limited. Kenya, who on March 15 announced its decision to ban plastic bags, is now the 11th country to take action in support of the UNEP’s campaign. Also in Africa, Rwanda and Morocco have already banned plastic bags and other countries are set to announce measures in the coming weeks. At that Bali Summit, Indonesia committed to slash its marine litter by a massive 70 per cent by 2025; Uruguay will tax single-use plastic bags later this year, and Costa Rica announced measures to dramatically reduce single-use plastic through better waste management and education. Canada added micro-beads (tiny particles of plastic) to its list of toxic substances, and New Zealand, the UK and the US announced bans on micro-beads in cosmetics. Isabella Lövin, Sweden’s deputy prime minister and climate minister told IPS in an interview that the world is going “in the totally wrong direction,” when it comes to achieving the goal of sustainable oceans and life below water. “If you look at the trends right now, you see more and more overfishing, we are seeing more and more pollution, plastic litter coming into our oceans, and we’re also seeing all the stress that the ocean is under due to climate change, acidification of the water, but also the warming and sea level rises. Together with Fiji, Sweden is convening a major UN Ocean Conference on 5-9 June this year. The Conference aims to bring together governments, the private sector and civil society organisations to create a more coordinated approach to sustaining oceans. It will look at the key role that oceans play in climate change but also other issues such as the alarming prospect that there will be more plastic in our seas than fish by the year 2050. “There’s 3 billion people around the world that are primarily dependent on marine resources for their survival and so they depend on what the ocean can produce, so it’s about food security, it’s also about livelihoods for hundreds of millions of people that depend on small scale fisheries mostly in developing countries,” Lövin explained. She also noted that rich countries need to work together with developing countries to address these issues, because the demand for fish in rich countries has put a strain on the global fish stocks that developing countries rely on. 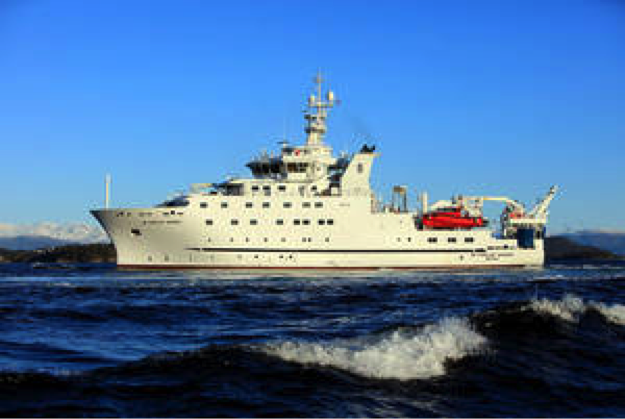 On Mach 24, Norway and the UN Food and Agriculture Organization (FAO) launched a brand new, state-of-the-art marine studies vessel, among the most advanced of its kind — and the only research ship on the globe that flies the UN flag. Its mission: to investigate some of the planet’s least-explored oceans, using cutting-edge technology and sophisticated equipment to help developing countries assemble scientific data critical to sustainable fisheries management and study how a changing climate is affecting our oceans. The new Dr. Fridtjof Nansen vessel —the 3rd ship to bear that name during an on-going 40-year partnership between FAO and Norway— houses seven different laboratories packed with high tech gadgetry. As the only research ship on the planet flying the UN flag, the Dr. Fridtjof Nansen is able to sail freely across different jurisdictional boundaries, unfettered in its pursuit of natural resource challenges that transcend borders. Speaking at the ship’s naming ceremony in Oslo, Norwegian Prime Minister Erna Solberg stressed that both science and international collaboration will be key to implementing the 2030 Development Agenda. “Norway, with our long coastline and ocean culture, understands the importance of SDG14, with its goal of protecting our oceans. We know this can not be done by any one country on its own. It requires us all to do our part, and Norwegian-FAO cooperation on the Nansen is an example of collaborating with developing countries to achieve this,” she said.